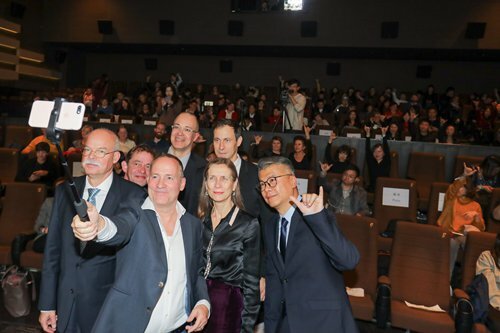 The ongoing 6th Festival of German Cinema in China (FGCC) is a carnival of entertainment for lovers of German films and TV dramas as it has brought a total of 12 films to select cinemas in Beijing and Chengdu, capital of Sichuan Province. 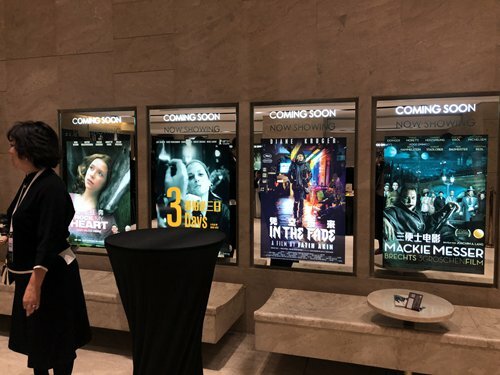 The festival, which kicked off on Friday in Beijing, is screening 12 of the latest German films and drama series throughout its run, including director Claus Räfle's 2017 Holocaust movie The Invisibles, Germany's 2017 Oscar pick for Best Foreign Language Film category In The Fade and TV crime series Babylon Berlin. German actors Marc Hosemann and Henning Peker, the stars of Babylon Berlin, attended the festival's opening ceremony, which was followed by a screening of The Invisibles. While waiting for the screening, Hosemann even tried to say hello to the gathered Chinese audience using awkward Putonghua (Standard Chinese), which he joked that he learned from Ang Lee's Crouching Tiger, Hidden Dragon. "I love Chinese movies like Crouching Tiger, Hidden Dragon and House of Flying Daggers. Their action scenes and the way they fly and grab things are just cool," the German actor told the Global Times later during an interview. "We look a little bit at what kind of films [they are]. Has the film been to international film festivals? Has it been successful with international audiences? And then we choose those with important subject matters… and we do a mix of young directors and more experienced directors to ensure variety," Mariette Rissenbeek, managing director of German Films Service + Marketing and one of the festival's major organizers, told the Global Times at the opening ceremony, explaining how the selection process worked. She also talked about what makes German films so special. "German directors tend to be more complex. They don't like too simple stories. They're philosophical, they're political," noted Rissenbeek, pointing out that German films, unlike Hollywood popcorn flicks, are for audiences who "every now and then would like to see movies that give you more to think about." Hannah Arendt and In Times of Fading Light have been two of the most seen films shown at the festival over the past five years, which kind of "surprised" Rissenbeek since the two films are very different. "Hannah Arendt is about the German philosopher. It was the most popular film of our program that year [in 2013]. And last year's In Times of Fading Light, about the former GDR [German Democratic Republic] was also much appreciated. I was surprised… both films are different, but they're both about important subject matters," Rissenbeek told the Global Times. The opening film, Räfle's The Invisibles is a documentary/drama about four Jews who managed to survive the Holocaust in 1943 by hiding themselves away from the Nazi regime in Berlin with the help of their families and friends. The film mixes real-life interviews with the four survivors with dramatic reenactments of their stories. Winner of the Gershon-Klein-Film Prize for best German film with a Jewish topic at the Jewish Film Festival Berlin & Brandenburg 2018, the film sparked widespread discussion after it was screened at a number of film festivals worldwide last year. The film took Räfle eight years to bring to the silver screen, mainly due to a long hiatus the director took during production. According to Räfle, from 2009 to 2013 there were very few German-produced films about the Holocaust, since German TV studios claimed that German viewers had grown tired of them. Due to this The Invisibles project came to a halt for a few years. "It is understandable, as before there were too many of them. Some of them were either irrelevant to the theme [of the Holocaust] or were just looking for success by using the theme," Räfle told the Global Times, noting that he was finally able to get backing for the film again in 2015, as that year marked the 70th anniversary of the end of World War II. Räfle noted that he was inspired to make the film while doing research for a documentary on the Nazi regime. As he was searching through materials, he came across a story about a Jewish woman who managed to survive the Holocaust by working as a service maid in a German establishment using fake identity papers. "Then I thought, if it is possible that a Jewish woman could survive in such a dangerous place with microphones and Nazis, then there must be many more," Räfle told the Global Times. According to Räfle's research, there were around 7,000 Jews, mostly young people, trying to survive in Berlin at the time, but only 1,700 survived. "Let them [the survivors] tell their stories, and that's what we did," said the director. Three of the film's four survivors have now passed away. According to Räfle, the last survivor, a 94-year-old woman, was very excited when he told her that her story was going to be shown in China. Aside from the screening events, this year's FGCC is also holding seminars to promote exchanges between Chinese and German film experts. The festival will come to an end on November 21.